Picasa HD is a free Windows 8 Picasa app available under “photo” category of its App Store. 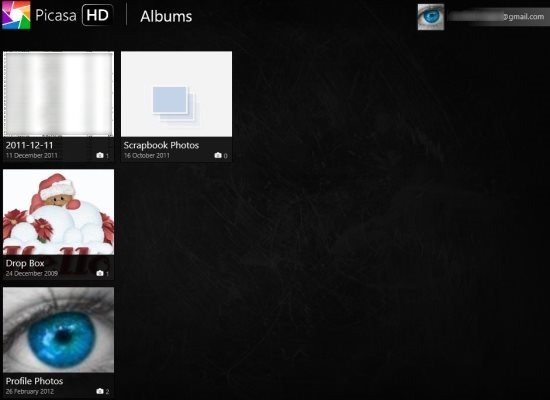 The Picasa Windows 8 app lets you browse and view your albums with ease. It presents the photos in high-resolution in full-screen mode on your Windows 8 PC screen. Also, this Windows 8 Picasa app lets you view all the details of the photo which include the name and the date of the upload. In addition, you can browse and view your photos according to the album set. Just login with your Google account and get started. The app will automatically import all the photos which are their on your Picasa. Well, the good part of this Windows 8 Picasa app is slideshow feature. You can play the slideshow of the photos in a particular album. Just open the album, right-click, and play the slideshow of the photos saved in the album. The app even lets you zoom the photos in full-screen mode. Note: The free version of the app is ad-supported. On first day of app download, the free version will work like a trial version of the paid version without the ads. From the second day onwards, the free version will start displaying the ads. This Picasa Windows 8 app might prove to be best for Picasa users who usually manage their albums and photos on Picasa. Lets have a look on some of the basic features of this Windows 8 Picasa HD app. Browse and view all the photos saved on Picasa with ease on your Windows 8 PC. Tile based interface displaying the albums and photos in tiles. Lets you view the details of the photo which include name, date, dimension, camera, focal length, flash, and much more. Zoom in and zoom out the images. Play slideshow of the photos on Picasa. Download the photos to your Windows 8 PC hard drive. Picasa HD app can be download from Windows 8 App Store. Just launch the app and search for “Picasa HD” app. Else open this link in IE10 and proceed with further downloading steps. The app will b downloaded and installed on your Windows 8 PC. It’s time to wrap the article by just saying that Picasa HD app makes it easy for you to browse and view photo albums on your Windows 8 PC. I like the slideshow part and the tile based style of displaying albums and photos.